The Information Technology sector is once again leading a performance meter in a stock market. Not only mega caps are showing good results but also other tech players among the big and small-caps. Using a trend following the strategy I have found two interesting stock picks with an optimistic price outlook. One big-cap CGI Group Inc. (NYSE: GIB) and one small-cap Comtech Telecommunications Corp. (NASDAQ: CMTL). A company provides IT and consulting services within application, infrastructure or business process segments. They offer solutions in credit, payment and trade, cybersecurity and various other areas using information technology. The last reported earnings have beaten the estimates $0.78 to $0.77. Revenue growth was also pretty positive over 10%. A stock price is on an upward trend since 2009 with very clear price following outlook. 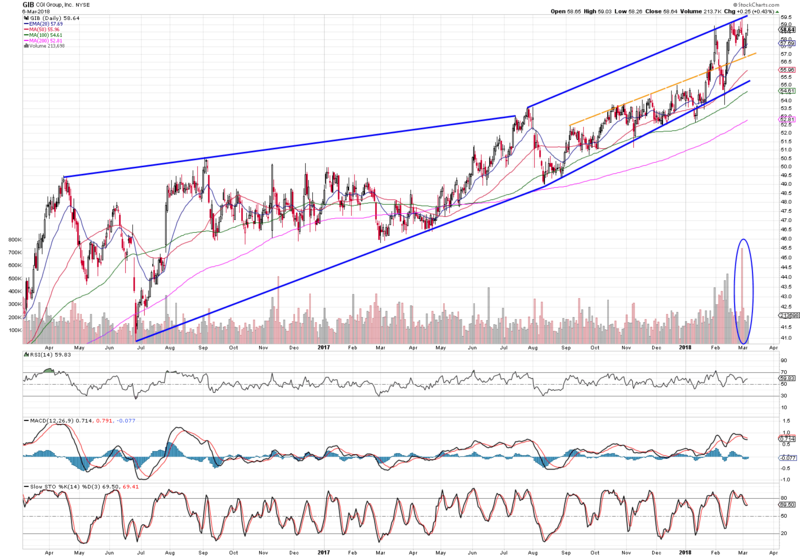 The price is moving within bull trend channel depicted by blue lines. The most current and strong support is 50 MA. Any pullback toward 50MA or lower blue line should be considered as buying opportunity. A significant volume exchange on 28 February accompanied with not that significant price change signals a lot of profit taking with high interest for the share ownership from buyers. Furthermore, the following 7 days until now still hold the price at the same level. This is a sign of relatively positive outlook CGI Group. Comtech develops and produces systems and provides services for advanced communication solutions. The company provides applications and technologies not only to commercial customers but also to government customers such as state and local governments. The last reported earnings have beaten the estimates $0.07 to -$0.28. This is a 75% surprise. The stock has been trading in a bull trend channel (blue lines) since June 2017. For last five months, it has been bouncing between its long-term resistance (orange dashed line) and 100 MA until it finally broke through and stayed above. At the moment with current sector up-trend, there’s no doubt the price will most probably continue rising. Furthermore, as soon as this setup raises the attention of more market participants, it may fly up significantly. 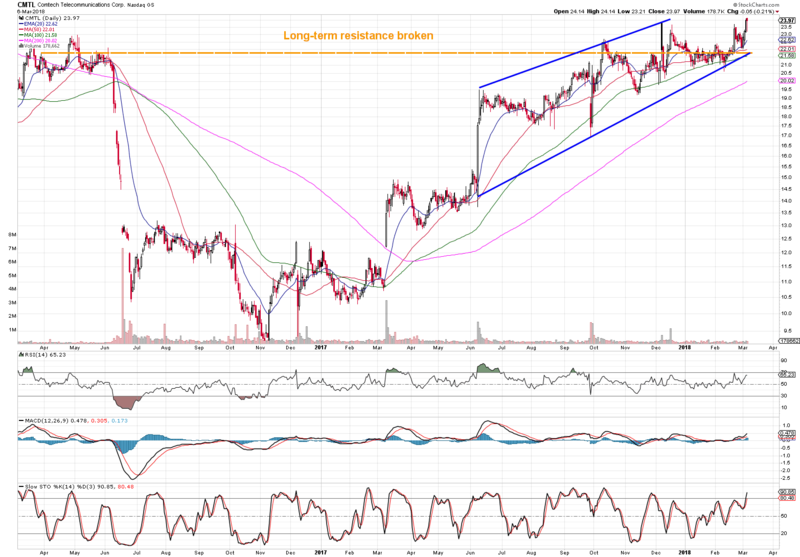 The broken orange resistance represents a support level now. Both companies bring good investing opportunity. In a long perspective, the investors should profit from investing in the technology sector. Remember to stay disciplined and focus on the big picture!